In 1947, when the supposed UFO crash at Roswell was still an unfolding story, a couple of small town papers carried an article about the debate about the crash going on in “Bughouse Square,” Chicago’s “free speech park” in which soapbox orators and hecklers would gather every night when the whether was good. The article is probably the closest thing I’ve seen to a transcript of debates between regulars such as One Armed Charlie and The Cosmic Kid. On the next soapbox over was Herbert “The Cosmic Kid” Shaw, whose style was to take listeners on “philosophic flights of fancy to empyrean realms of thought,” and who would eventually be given a Druid funeral in the park. He took the UFO sightnings a bit more seriously, and believed they were evidence of life on other planets. The reporter noted, with awe, that The Cosmic Kid got all of that out in one breath. The next morning, newspapers would carry the official explanation: it was just a weather balloon. I’ve collected a ton of material on the park, including some great interviews that I used in the now-defunct Weird Chicago podcast, including interviews about the park with aldermean Leon Dupres and 1960 Beatnik Party “anti-candidate” for Vice President Joffre Stuart. One of these days I’ll re-edit into a Chicago Unbelievable podcast. Coming Friday: a new podcast to kick off “Grave Robbing Week,” which will be running all next week right here at Chicago Unbelievable! Stories about it got more and more bizarre. One guy said he saw it land on the water, and some guy came out onto a deck to go fishing. 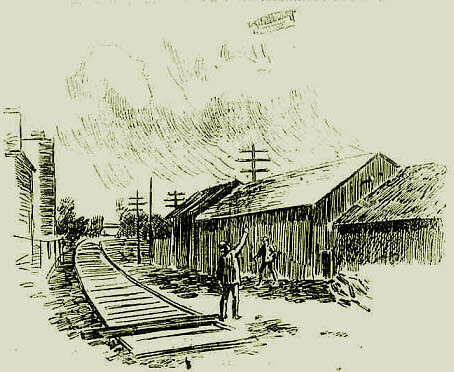 Another claimed that it landed in a field near his house and the pilot told him that “I will tell my story to the government when Cuba is free” (keep in mind, this was the era of the Spanish American War, a war noted for the stories newspapers made up to push America into the war in order to sell more papers – this was probably one of the more ridiculous ones). To this day, no one knows what the airship really was. Most of the sightings were probably mistakes, and others were outright hoaxes. A few remain unexplained – theories at the time included that it was Venus, a shooting star, a guy in a balloon, or something cooked up as a publicity stunt by the Ringling Brothers (who didn’t nothing to discourage this rumor – it was just good business). And only in Chicago, as far as we know, did anyone photograph it. Though papers indicate that the photographer sold several copies, no photo seems to have survived. The negative was given the “acid test” by the paper, which pronounced it to be genuine. However, the Tribune showed it to an expert who laughed at once and said the perspective was way off – what the photographer had probably done was take a picture, then paste the airship onto the picture, and then take a picture OF the picture. This would have stood up to the acid test, but not to expert photographers who knew just what cameras could and couldn’t do. Still, the mystery of the airship remains unsolved.